What's that? A bowl of caramel corn, one would think. But look again. More closely this time. Yep, that's right. 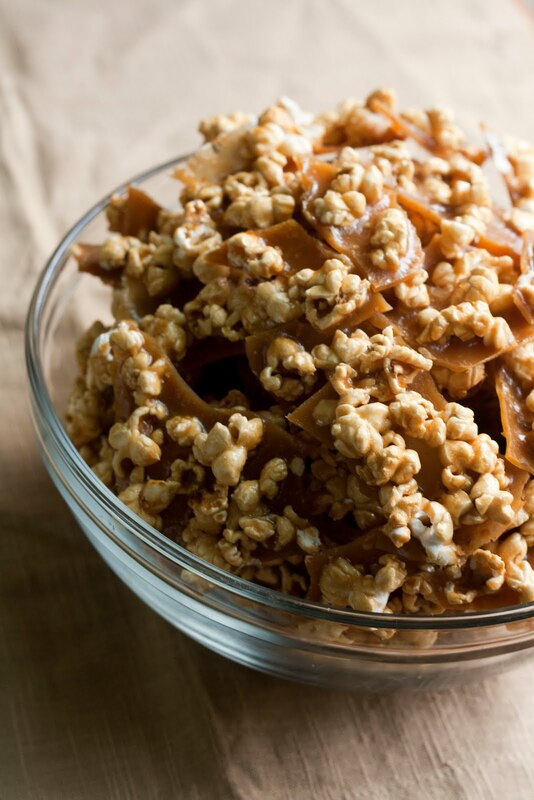 This isn't your average bowl of caramel popcorn, baby. No sir-ee. Separating each kernel of corn from the solidified candy shards was also proving to be more meticulous than I would have liked, and so I thought to myself: why bother? A quick taste of one of the shards told me that it had the wonderfully brittle, sugary, and caramelly taste of brittle. 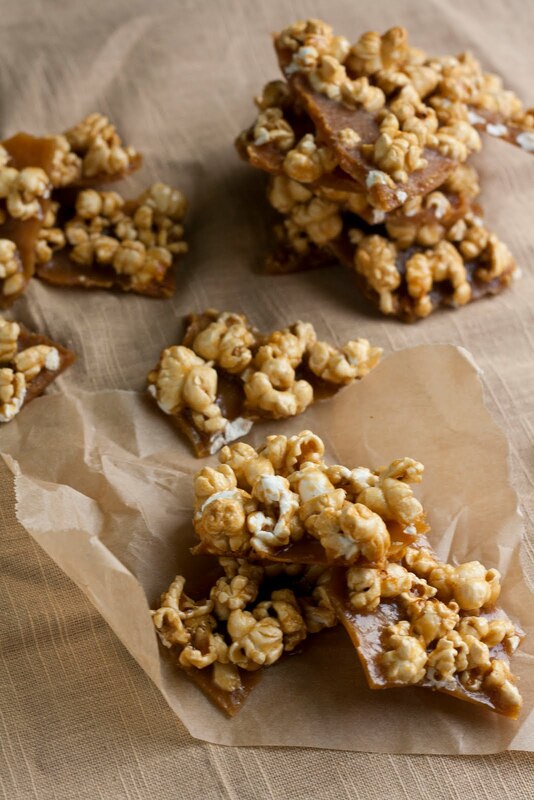 And so caramel corn brittle was born. Now the holiday season is approaching fast and oh boy, if you're one of those overachieving folks who likes to make their own Christmas/Hanukkah presents, this recipe is for you. This'll be the perfect DIY holiday present or stocking stuffer — all you need are some cute paper bags, ribbons, and voila! 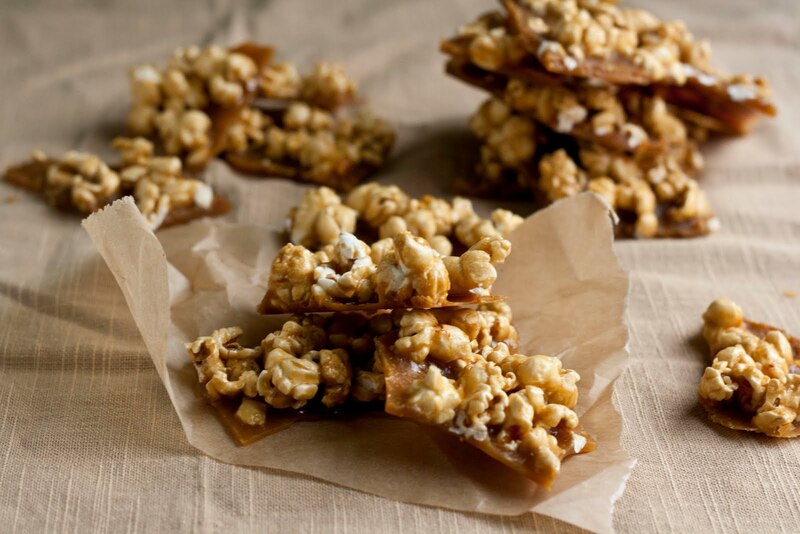 Because what is more festive than a bag of caramel corn? Nothing... except maybe a bag of caramel corn brittle! Line a 13 x 9" inch baking sheet with a Silpat mat and spread out 5 cups popped kettle corn evenly across the the mat. Heat 10 cups granulated sugar in a medium, heavy-bottomed saucepan over medium-high heat. As soon as the sugar starts to melt, use a heatproof spatula to move it constantly around the pan — you want it all to melt and caramelize evenly. Cook and stir, cook and stir, until the caramel is a deep, dark amber. Be patient! I know it takes a while and a lot of stirring, but you'll get there. 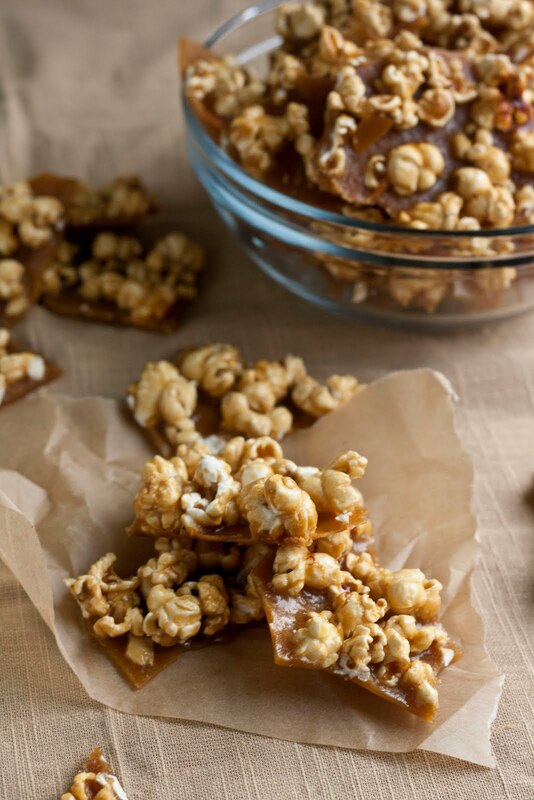 Once the caramel has reached the target color, remove the pan from the heat and, using the heatproof spatula, pour it over the baking sheet prepared with popcorn, using your rubber spatula to spread out the melted sugar as thinly and evenly as possible. The caramel will set in less than a minute, so work quickly. Let the sugar and popcorn mixture cool completely by setting the baking tray on a cooling rack and letting it harden until it forms a giant sheet of brittle. Once the brittle has cooled completely, break it up into pieces and store in an airtight container. Well this looks incredible! I've been looking for something unique to make for our neighbors - this is perfect. I posted a toasted coconut kettle corn recipe on my blog which would be a fun twist on this. I was wondering if I could sub. half the white sugar for brown sugar? Will it still turn out relatively the same. I have a lot of brown sugar in my cupboard waiting to be used and don't feel like hitting the grocery store on the way home from work. Hi Tiffany, I'm not sure, I've only ever made it with white sugar... might be worth giving it a try though? Let me know how it works out! Yum.. this is super sophisticated. Sometimes when I need sweet and salty I throw in some chocolate chips on top of my popcorn! This sounds insanely delicious and looks gorgeous! I love how you also sort of stumbled across this--those are some of my favorite recipes (eureka in the kitchen!). We're celebrating our favorite holiday recipes on the Shine Supper Club this month and a recipe like this one would be a perfect contribution. I hope you'll join us! Oooooh, that sounds amazing. Super sweet so you only need a little, I bet! 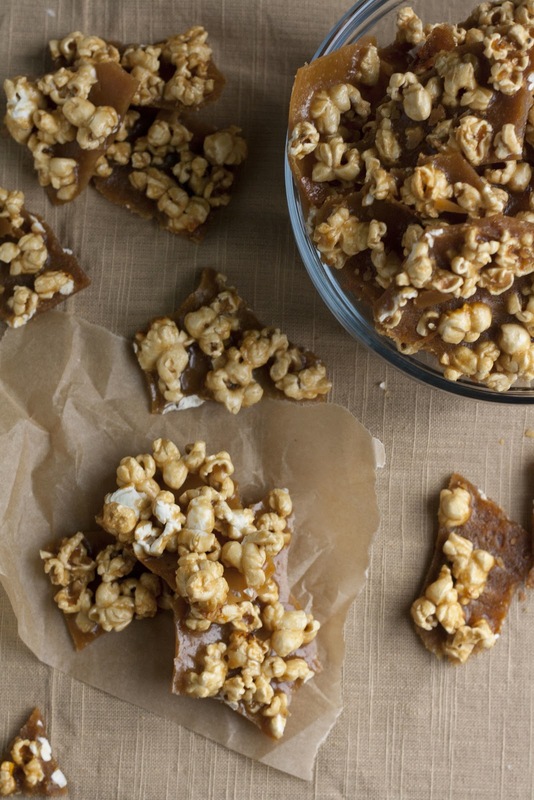 I love brittle if it's a little salty, too, and I bet the popcorn is the perfect texture. I am impressed by how beautiful your brittle parts look... usually when I to make "candy" and get the high temp, it doesn't work. Oh boy, let me tell you... it takes a lot of patience to make good looking candy. Most of the time my candy doesn't work either, especially since I'm so impatient that I'll walk away from the stove repeatedly... but if you force yourself to stay by the oven and get that high temperature, it'll happen. I promise!